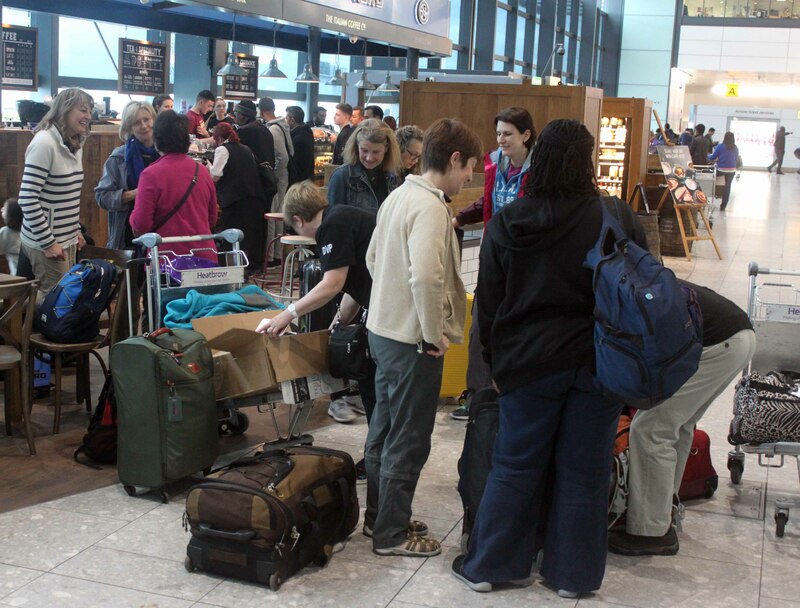 The participants in the February Dental Volunteer Programme duly met at Heathrow's Terminal 5 this afternoon. Robert Dyas (no, he does not own a chain of London hardware stores!) arrived with his collapsible guitar. This means that they will have some on-site entertainment at the gold mine this year. 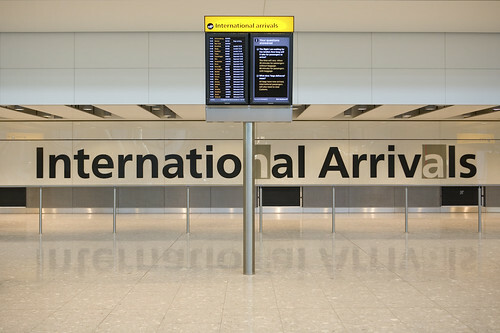 Some of the team were flying in to LHR from other UK airports and so they all decided to meet up airside. Pictured here are (from left to right), Su, Kiaran (team leader), Sam (a newly-qualified first-timer from Kiaran's practice near Blackburn) and Liz. 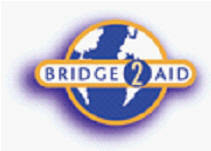 This is the FIFTH time that Liz has been out to Tanzania with Bridge2Aid. This time she is accompanied by only one of her two nurses, Su Mills. As regular readers of this blog will know, Su had to cancel her participation in the Nov 2010 programme as her son was ill and so it is great that she is able to make it out there again this year. They were each given a new B2A T-shirt to wear as the charity takes branding very seriously. British Airways Flight 047 to Dar es Salaam was due to set off at 18.45 and was finally airborne at 19.03. I think that the flight path is over Egypt and Sudan, rather than Libya, which is probably just as well, given what is happening there. It is due to land in the steamy heat of the Tanzanian capital at 07.28 tomorrow morning. The flight landed early at 07.17 and they have a three-hour stopover before they catch the Precision Air flight up to Mwanza at 10.10. Liz rarely has a good word to say about Dar as the humidity is stifling. Shown on the right is the view as you arrive at Dar airport. One of the team, Prue, comes from Christchurch and so I hope that her relatives are OK, following the earthquake overnight. My best man is down there at the moment, as well as three people from our church. I have already heard from two of them to say they are OK but that their itinerary may need to be 'tweaked'. I have just received an email from Mark Topley in Mwanza to say that Prue has been in contact with her Mum, who is OK, although communications are poor as they have no electricity. I got through to Liz in Mwanza at about 17.30 GMT. She had managed to watch The Social Network and Made in Dagenham on the way out but also slept a lot. They were accompanied on the flight by Alan Frampton, Chairman of the B2A Trustees and one other trustee. Also with them were Lord and Lady McColl. Ian McColl is chairman of the Stevenage-based charity, Mercy Ships and he is interested in seeing, at first hand, what B2A has achieved. The founder of B2A, Ian Wilson and his wife Andie, are due to leave Tanzania this year and return to practice-based dentistry in the UK (what a change! ).Alan made a very powerful speech at the dinner this evening about all that they have done in their 9 years in Mwanza. It will be very strange for their 3 children to go to school in the UK. They met up with all of the others, including Prue, who had arrived 2 days ago and has been working at at a children's home called Forever Angels in Mwanza (see http://www.foreverangels.org/). Tomorrow they have their orientation session, before they split into two groups. One will be based in Mwanza, and go out to neighbouring villages from there. The other (including Liz) will make the 3 ½ hour journey in the afternoon, by ferry and road, to Geita gold mine, where they will be based. Their group's B2A 'fixer' will be John Simba (Kisahihili for 'lion'), who will be familiar to blog-readers from previous visits. Apologies to readers for the tardy update today; MANU were playing in the Champions' League and my computer is not in the same room as the TV. I heard today from the guy who was my best man. He and his wife flew out of Christchurch on Sunday and so missed the eathquake (just!). They are now in San Francisco and so seem to be doing a tour of seismic zones. I also heard from two people from our church who haved tapped into the blog from Napier on the North Island of New Zealand. I got through to Liz just after they had arrived at the gold mine. 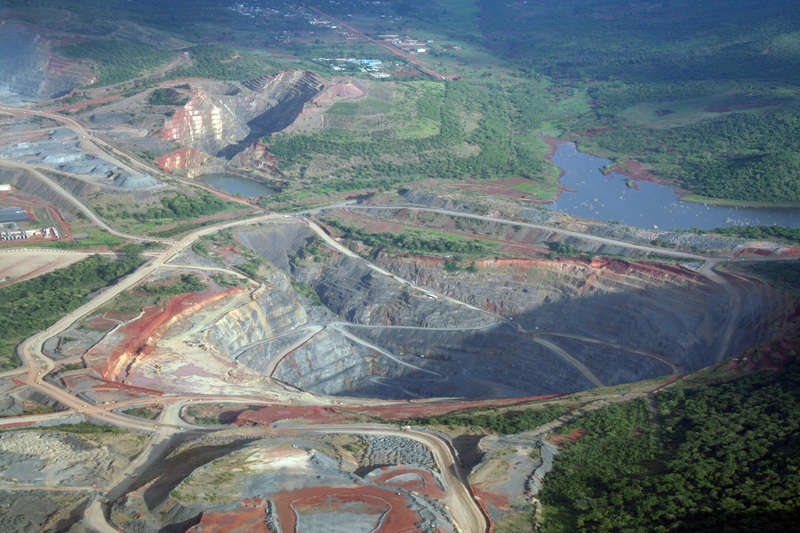 The picture on the left is one that Liz took in November as they flew over Geita mine (see http://en.wikipedia.org/wiki/Geita_Gold_Mine ) which is where they are now going to be billeted for the next 7 days. As you can see from the map below, Mwanza (top right) is on an inlet of Lake Victoria. They caught the (very modern!) ferry across the inlet, which took half an hour and then made their way to Geita mine, which took about 3 hours. En route they saw loads of kingfishers (the type that sit on telegraph wires and do not go near water). It took a while to go through the stringent security checks (it is a gold mine !) 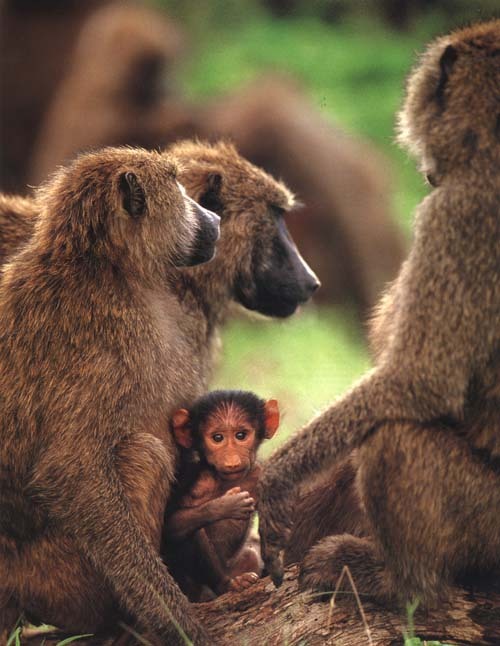 and, after passing numerous baboons on the site, they checked into their quarters. Liz is billeted with two others in a house. Tomorrow they set off to the first clinic in a Nzera (see map) where they will spend the first three days. They then have a rest (not going back to Mwanza this year) and then spend 3 days in Katoro (see map). The second clinic should be a lot easier to get to as it is near the main road. Tomorrow it will take them about 1 ½ hour each way, along dirt roads ! At the orientation session today, they learnt that, since it set up, Bridge2Aid has trained no fewer than 150 Clinical Officers in basic dentistry, over 21 separate trips from the UK.. Each officer has a patient base of up to 15,000 people in remote areas and so B2A has enabled dental care for approx 1.5 million people who previously had nothing ! Apparently the Government has said that, as tomorrow is due to be fine, they want all of the farmers out in the fields and so it is not clear how many patients they will have. They had to get up this morning at 05.30 as the minibus left at 07.00 to drive the 1 hour journey to the clinic at Nzera. They drove through quite a densely forested area until they reached the clinic, which serves the local area. As usual, there are six Clinical Officers to train, one of whom works in the clinic at the gold mine. Liz was assigned to one of the two ladies, Agnes, and reports that they all seem to know their stuff, although Agnes' English is not good. They treated 76 patients today, including one with the typical local tribal name of Steven Gerard ! Liz was working on the verandah at the end of the clinic, to get some light, and had to operate whilst the whole queue of about 30 patients watched. They could not treat all of the patients who turned up and so some of them will be back tomorrow, along with some 200 schoolchildren who are due to arrive for a check-up ! Just before they left today to drive back to their base, a baby was born at the clinic. Tomorrow they may pay a courtesy visit to the local witch doctor. Regular readers from earlier blogs will know that these guys still wield enormous influence, when they are not away in the spirit world (i.e. back in Mwanza, driving a BMW!). Apparently there is a tree full of weaver birds near to the mine canteen, which gives me an excuse for today's photo. They set off early again this morning, driving through rice fields and pineapple plantations (just like Knebworth, then). Liz says there are loads of people on bicycles piled high with pineapples. When they arrived there were about 300 people already waiting, some of whom had been queuing since 3 in the morning (definitely NOT like Knebworth!). This was the largest number of people who had ever attended a B2A clinic. The Regional Clinical Officer saw most of the children but the team saw about 160 patients altogether, the better trainees working by themselves under supervision. Liz alone saw 21 patients. They had to send some of them away but you can rest assured tha they will be back again tomorrow, now that they know about the standard of treatment. Better than the witch-doctor with a scredriver (see 2008 blog). The picture on the right shows patients queuing at a clinic in 2009. Agnes was again assigned to Liz and she found out that she has an 8-month old baby (Agnes - not Liz), whom she has to leave behind each day. One patient turned up with jaw cancer (I hate to think how long that had gone untreated) and another, who was treated yesterday, turned out to have some sort of blood-clotting disorder and had to stay the night in the clinic (remember - no running water or electricity!). The mine is, according to some of the ex-pat wives, one of the best around, with a mini-market akin to a Tesco Direct, beautiful tress and grounds. Tomorrow they have a BBQ in the evening at the golf club. Some of the ex-pats have been at the mine for 4-5 years. Today's wildlife included lots of herons in the paddy fields and an African goshawk, tearing prey to shreds in a tree next to the clinic. As she does not seem to be able to make ougoing calls, Liz texts me and I phone her back. She was surprised, today, when I phoned back from the home land-line. She had expected me to be in a meeting in the City and had forgotten that it was Saturday! Regular readers of this blog may well have noticed a difference in the pattern of this year's programme. Instead of flying out to Tanzania at the weekend, they flew out on Monday and will not have the usual two days off in the middle weekend. The charity was finding that the logistics of arranging for the team to be able to go to the Serengeti on Friday evening were just too challenging. Instead they will work for three days at one clinic, have Sunday off at the gold mine, and then work three days at the second clinic. Some of the team are going off for a short safari at the end of the programme but Liz and Su will be coming back to Blighty. Liz had always said that she came back from the middle weekend really tired after all the travelling. They arrived at the clinic today (their last day in Nzera) to find that there were 200 people waiting again. At one point in the morning John Simba, their fixer, had to go and ask the village elders to calm things down. One can only imagine the desperation to be treated. I am bad enough after two hours of toothache; the average people have been with dental pain in this area of Tanzania is 2 years! Apparently whilst they usually see a lot of single-tooth decay from chewing on sugar cane, the decay is more widespread across the whole mouth. The cause of this? .... the pineapples mentioned earlier in this blog (see picture left of pineapples growing). One 30 year-old woman today had such bad decay that it had eaten through her bone and was discharging through a hole in her cheek. Liz had to extract teeth whilst being watched by the whole queue of about 100 people who almost applauded each extraction. Agnes has learnt so fast that she alone saw 33 patients and extracted 43 teeth. She had her baby with her today who was passed around the team for cuddles. A trainee called Alex was assigned to Liz today; he has 4 children and is the resident clinical officer at the clinic they will be based at next week. The clinic was a Catholic mission and is now jointly run with the Tanzanian Government but a Catholic sister is still in charge. At the end of the day they had to turn patients away, which is disappointing for all but there really are limits to what they can achieve. At least there will now be more clinical officers who are trained up, although not necessarily in that village. All they could say was that B2A will aim to get back Nzera in September (not a good line for the practice in Knebworth). 20 Boy Scouts turned up today with pangas (a type of machete) to cut the grass (Health & Safety ?). The lead dentist, Kiaran, realised that she had dropped her glasses and only just recovered them in time from the grass. On the way baxk to the mine they heard music and encountered lots of people on the side of the road engaged in tribal 'line dancing'. Liz was off to the BBQ at the golf club and so she could not stop and chat. I think they deserve the rest ! Whilst the two teams have been running their clinics, Lord and Lady McColl from Mercy Ships have been seeing the work done by B2A, including a visit yesterday to the village of Bukumbi, which is a shelter for lepers and albinos; the latter are often killed in Tanzania by witch doctors. You can read all about their visit on the B2A blog (see http://www.bridge2aid.org/blog/visitors-at-bukumbi ). Liz's text came through as I was at lunch with friends from church. Unfortunately her 'phone then ran out of credit and I had to rush down to the local supermarket to top up the account. After the efforts of yesterday (the records show that they have treated 397 patients in the three days so far! ), and the BBQ in the evening, Liz and the others in her house slept in until 10.30 and missed breakfast. They then went to the pool and had a swim, ending up in sunstroke which caused Liz to get another 2½ hours sleep. This evening they have a quiz, which I set for them. There are rounds such as 'Africa in Music' and 'Africa in Films' and some of the questions may well make their way into the Knebworth Quiz Challenge in October. There is also a wig party this evening, which will see Liz as Cleopatra. No wildlife update today, other than that there are lots of butterflies around and loads of baboons (see right) on the golf course. I wonder if there is some local rule 'Baboon stole ball'. As I have been typing this, England have drawn with India at cricket ... quite a match ! Tomorrow's blog will be published late, as I have to go and see the eye surgeon for a final check-up after work. Another day, another 135 patients, this time at the clinic in Katoro, which is a much larger town. As mentioned in an earlier episode of this blog, this is the clinic where Alex, one of the trainees, is the resident clinical officer. When they arrived they had a mild panic as there were hundreds of people there but this was largely because there was a mother-and-baby clinic there today. The clinic is quite new ... with a proper porcelain squat toilet (such luxury!) ... but still no electricity or running water! Liz was training Judith today, who is the resident clinical officer in the town of Geita near the mine. They had to drive through the mine and out the other side to get to the road to Katoro and so were able to see just how big the mine is, with lots of trucks with enormous tyres (left). The wig party was a success, with two of the dentists wearing pink and purple wigs and one of the, Barry, sporting a multi-coloured wig. The Quiz also went well, with the winning team scoring 42 out of 60 (almost as high as the Simpsons' team in Knebworth! ).They have been practising the song that I wrote for when they get back to Mwanza. Imagine 'Can you feel the love tonight?' from The Lion King, but substitute 'Shall we pull a tooth today?'. ...and would the next 150 patients please come forward ! Liz has been training Mwigamba today, who has been struggling a bit with the training. Kiaran likes Liz to take over the trainees who are finding it all a bit challenging. Mwigamba is the resident clinical officer at the jail in the town of Geita, where there are some 450 inmates. The team were offered a trip around the jail tomorrow but (un)fortunately they will be too busy! I managed to find a picture of Geita town (right). 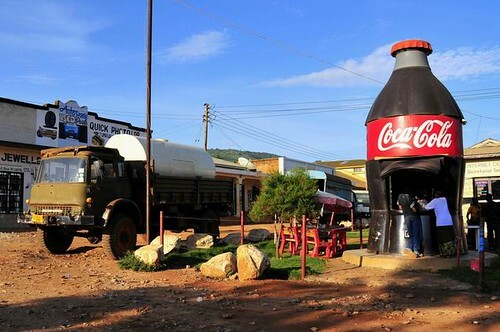 Note the high-profile presence of Coca-Cola, which is a real challenge to dentistry in Tanzania. Liz reported that this clinic is much better as they can do the dentistry away from the queuing patients, which means they can focus a lot more, apart from the 15 donkeys who were braying in the background all day. Today's wildlife comprised about 100 baboons crossing the road as they left the mine. The minibus had to wait for them to cross. Apparently the weather is nice but at midday, when the sun is virtually overhead (they are onlu 2 degrees South of teh equator), it is extremely hot and they have to be careful to sit in the shade. On the way back to the mine, the driver stopped to buy a live chicken which travelled with them under the front passenger seat. Today they only saw 118 patients ... but they did finish at lunch-time so that the trainees could sit their exams, which will be marked tomorrow morning. The highlight today was that one woman patient came in and was seen and then went next door to another clinic and gave birth ! They missed the ferry and so had to wait for an hour or so for it to ply its was across the inlet and back. 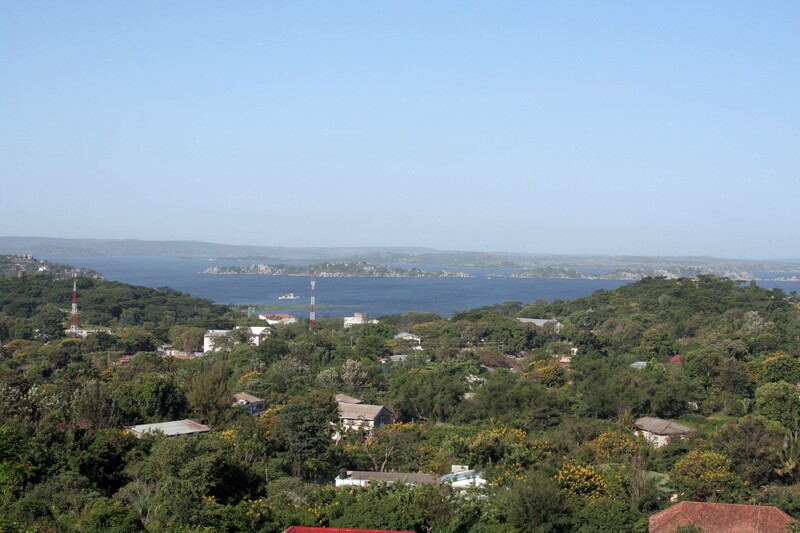 They then arrived back in Mwanza and made their way straight to the Isamilo Lodge, which has a good view over Mwanza and Lake Victoria (see left). They had not had a chance to change out of their B2A T-shirts but the other team, which had been based in Mwanza, had dressed up for the evening, which included a curry buffet. Apparently one day the other team had been back with Prue to the Forever Angels orphanage and spent a few hours with the babies there.The Mwanza-team seems to have only seen about half of the patients seen by Liz's team. Tomorrow is a chance for those who have never been to visit the leper/albino village at Bukumbi, which is also administered by Bridge2Aid. Liz, who sounded cream-crackered, will stay in Mwanza and get some rest and mark the exam papers. The goods news today is that all of the trainees passed, which means that there will be 12 more clinical officers who are able to offer rudimentary dental treatment for their catchment areas. In all, over the past 6 days, the two teams have treated no fewer than 1,200 patients. Liz reckons that the 'away' team, of which she was part, probably saw 750 of those patients. They were back at the Vizano, when I phoned, having had a nice farewell meal at the Tunza Lodge, where they sang the song that I mentioned earlier in this blog, against a backdrop of waves crashing on the shore of Lake Victoria, Kiaran could not add her voice to the chorus, as she is unwell, and Liz sounded a bit rough ... but that could have been the gin and tonic ! She has out buying batik prints today for friends who had placed orders. They also accompanied Prue back to the Forever Angels orphanage and spent the afternoon playing with toddlers (see picture on right). Prue is going to spend a few more days at the orphanage, where many of the children are HIV positive. The wigs from the party a few days ago have been donated to the orphanage; imagine some toddler dressing up as Cleopatra ! Kiaran has decided to fly home with them tomorrow as she feels rough, rather than go on a mini-safari. As far as I can see it takes off from Mwanza at 14.30 and is only a 1½ hour flight. They are going to check into the executive lounge as their flight to the UK does not take off until 23.30. I caught up with Liz today at Nairobi airport. She had not, as I had thought, caught the direct flight from Mwanza to Nairobi but,for some reason, had flown with Precision Air from Mwanza to Kilimanjaro airport and then on to Nairobi. 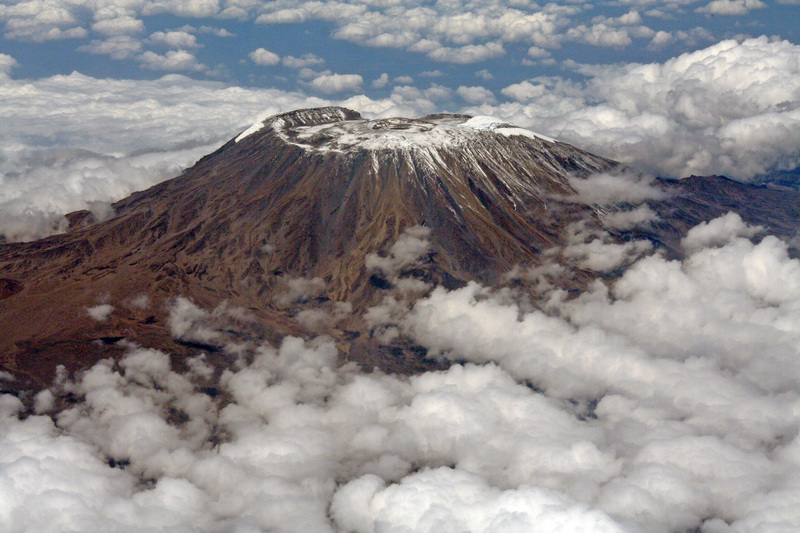 On the left is a picture she took of Kilimanjaro in 2009. They were about to go into the Executive Lounge (Kiaran has a card) and rest until the flight. They are due to land at 05.20 tomorrow morning, which means that the dutiful husband will set off from home at about 04.30. UPDATE Unfortunately for me (but not for them!) the flight took off just 3 minutes late and is due to land at 05.27. Our son, Luke, suggested that I tell them to get the Tube from Heathrow to Cockfosters (90 minutes) and that I pick them up there but something tells me that wouldn't go down well ! I got up at 04.00 and logged on, only to find that the plane was due to land early at 05.10. Time enough, though, to make it round a VERY quiet M25 to Terminal 5 and to have a coffee. I must admit that I kept thinking of Matt Lucas as the Caribbean barista in Come fly with me. I was under instructions to take coats with me as it was hovering just above zero. They arrived OK and are now back home, armed with coughs. Glad to be back. Thanks for all of your support.